“But you will receive power when the Holy Spirit comes on you; and you will be My witnesses in Jerusalem, and in all Judea and Samaria, and to the ends of the earth” (Ac 1:8). On the fortieth day after the Resurrection, Jesus Christ said this and ascended to heaven. After ten days, He poured out the Holy Spirit on the saints of the early Church. Receiving the power of the Holy Spirit, apostles preached the gospel with boldness just as Jesus had commanded them. Amazingly, as a result, thousands of people repented and were baptized in a day. 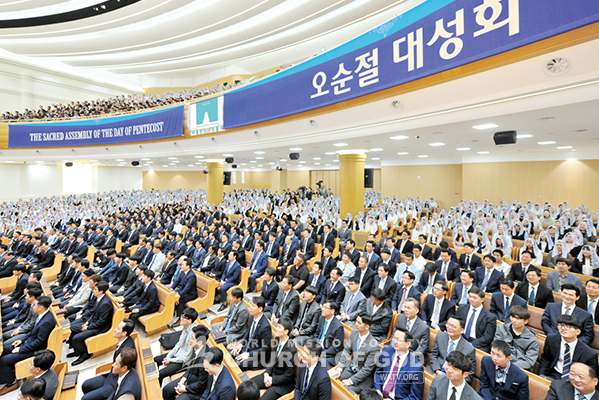 While carrying out the Preaching to Seven Billion Movement, the members of the Church of God all around the world attended the Ascension Day Service (May 10) and the Sacred Assembly of the Day of Pentecost (May 20), expecting the work of the Holy Spirit that occurred 2,000 years ago to be repeated again. During the Prayer Week of Pentecost, which started from the evening of Ascension Day, they prayed in the early morning and in the evening that abundant blessings of the Holy Spirit would come upon the whole world. Ascension Day is to commemorate the ascension of Jesus. Jesus’ going up to heaven forty days after the resurrection was prophetic fulfillment of Moses’ going up to Mount Sinai forty days after the Israelites crossed the Red Sea at the time of the Exodus. 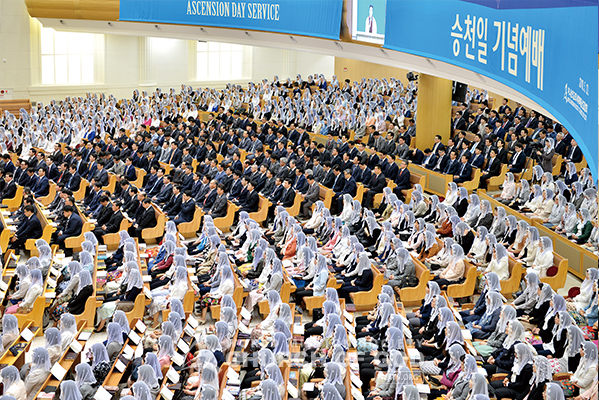 During Ascension Day Service held at the New Jerusalem Pangyo Temple in Korea, Mother deeply thanked Father for giving hope for resurrection and ascension to human beings who were destined to die. Mother also prayed for Her children to fully obey God’s word, so that on the day of salvation their natural bodies would be changed to spiritual ones and they would all enter heaven without a shame. General Pastor Kim Joo-cheol explained the origin and meaning of Ascension Day through the Old and New Testaments. “Jesus’ ascension is clear evidence that God’s people will have spiritual bodies and ascend to heaven,” he said. “We have been approved by God to be entrusted with the gospel. As God’s witnesses, we must not be silent but preach the truth and lead people to salvation. Let’s powerfully preach about God the Father and God the Mother, who have come to this earth to save our souls. Let’s evangelize the world and participate in the blessings of resurrection and ascension,” he said with emphasis (Lk 24:44–53; 1 Co 15:44–58; Isa 43:10; 56:9–12; Eze 3:17–19). After praying and preaching more earnestly during the Prayer Week of Pentecost, the members attended the Sacred Assembly of Pentecost, with a yearning to receive the power of the Holy Spirit that is essential for them to carry out God-given mission as His witnesses. In the Old Testament, Pentecost was called the Feast of Weeks. It was the fiftieth day after the Israelites crossed the Red Sea, when Moses went up Mount Sinai to receive the Ten Commandments. Such history was a prophecy fulfilled by Jesus when He poured down the Holy Spirit on His disciples on the fiftieth day after His resurrection, i.e. ten days after He ascended. Mother prayed that all the prayers and requests that the children of Zion had offered up for ten days would be granted by Father, and that every Zion would overflow with the blessings of the Holy Spirit. “Let us all become likeminded in the Holy Spirit, and carry out with all our heart and strength the Holy Spirit Movement to preach the truth of life in Samaria and to the ends of the earth,” Mother entreated. Mother wanted Her children to glorify God with holy deeds and to be prepared for the kingdom of heaven, being always alert, as the children who entertained the light of holy God’s love. 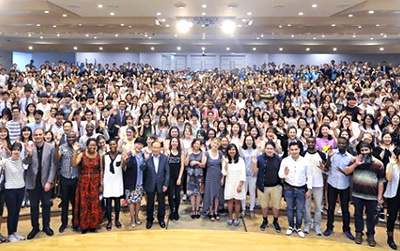 Comparing the situations before and after the advent of the Holy Spirit in the early Church times, General Pastor Kim Joo-cheol articulated the gospel vision of the present age. The Book of Acts tells that the early Church began to grow with the descent of the Holy Spirit. Apostles denied Jesus and ran away during the Passion. After receiving the Holy Spirit, however, they dauntlessly overcame persecution and suffering, led three thousand to repentance in a day, and guided a large number of priests to the faith. “As we’ve kept Pentecost, we can also experience an even stronger power of the Holy Spirit than they did in the early Church times. Let’s realize the will of God who gives out the gifts of the Holy Spirit to save seven billion people. Let’s demonstrate the Holy Spirit’s power to the full, so that we may preach God Elohim, the source of the water of life, to all nations and peoples,” he encouraged everyone (Ac 2:1–4; 6:1–15; Rev 22:17; 21:9–10; Gal 4:26; Zec 14:7–8; Eze 47:1–12). The members around the world gave their deep thanks to God for giving them the Holy Spirit on Pentecost, and determined to deliver the water of life—the truth of the new covenant—to anyone, anytime, anywhere, depending on the power of the Holy Spirit. “I prayed for love, endurance, courage, a broad mind like the sea, humility, wisdom, and eagerness, because those who are to be saved must participate in God’s divine nature. I’ll change to resemble God and preach the truth of life and love to all people in Athens,” said Ioanna Georgantziki in Athens, Greece. “Apostles could experience unimaginable blessings after receiving the Holy Spirit because they obeyed the word of Jesus. 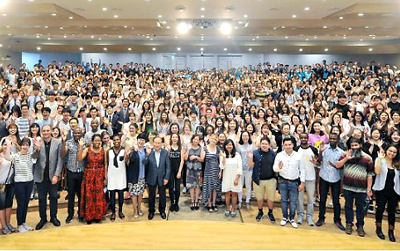 I believe that I too can receive such great, no, even greater blessings than apostles, when I obey the word of God,” said Lee Min-gyu in Seongnam, Korea. 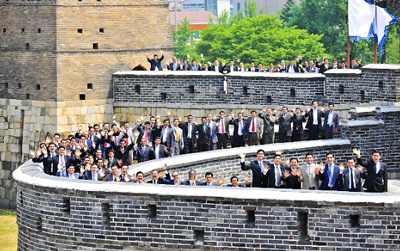 The members get busy carrying out the Preaching to Seven Billion Movement, putting on abounding gifts of the Holy Spirit, from character to preaching ability.